A few days back I went to Toys R Us to waste some time, sure enough I left the store with a little less money than I came in with. I didn't go too crazy luckily, what I bought was cheap; but don't let that word fool you, they're still pretty damn cool. When I see the company Jakks Pacific all I'm reminded off was the somewhat bland wrestling toys I was obsessed with as a kid. I guess they've branched out a bit though because while at TRU I saw they were making not only MIB 3 toys, but also these little guys. These are called "S.L.U.G. 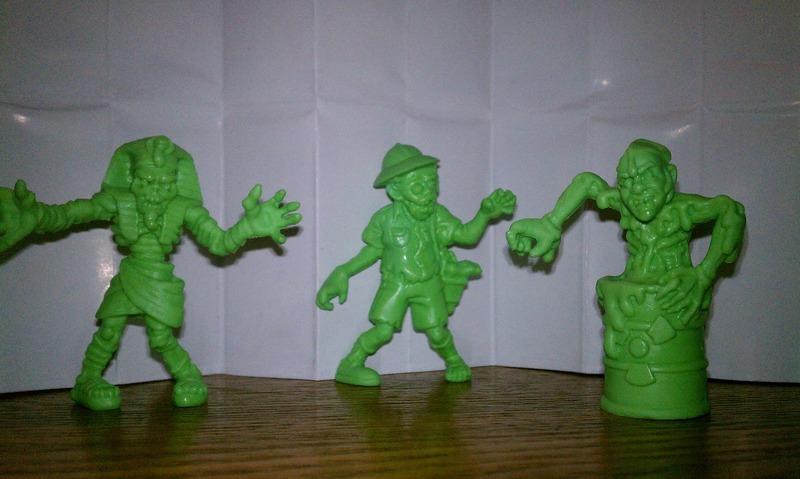 Zombies" and they're very reminiscent to (zombiefied) Monsters in My Pocket. I loved MIMP as a kid, so I couldn't resist. I decided to go with the pack that contained the ghoul bursting out of what could very well be a drum of Trioxin. Also included was a rotting pharaoh and a decaying postman. S.L.U.G. 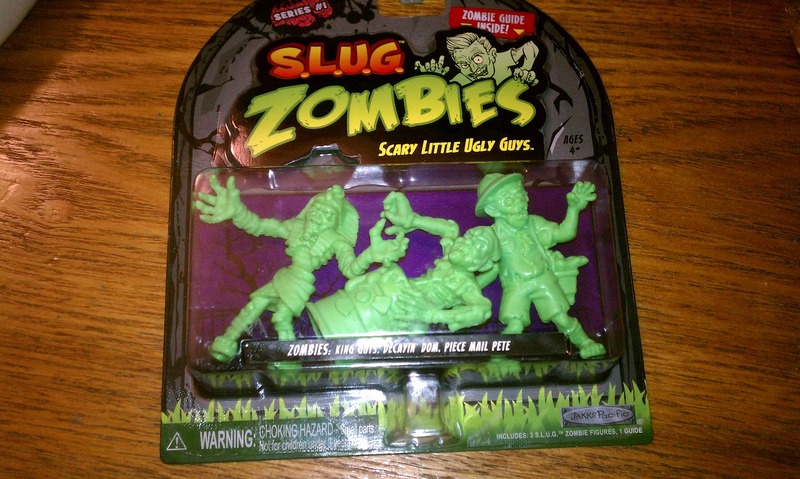 Zombies are available in a few different packs, single, three pack, and a coffin shaped 12 pack. Also available is a carrying case which includes a few glow in the dark characters. Now I realize some collectors might write these guys off. Sure, they're a bit nostalgic, sure they're certainly geared towards kids, but take a look at this character poster...Not only are they releasing a ton of these guys, but a lot of them you might recognize. Not only do we get a few zombified celebs but we also get S.L.U.G. versions of Ash, Charles Bronson, and Dirty Harry among a ton of others. I personally cannot wait to pick up more of these! Sorry about my near-month absence. Being the manager for a small business can be a real pain sometimes. Anytime we're short handed or someone quits I have to cover shifts and/or train new employees. Such is life. Anyhow, I'm working on some new reviews which will be up over the next few days. Next week I'll have some Texas Frightmare Weekend coverage alone with a look at some new posters and memorabilia I've picked up over the last month.